Watch this video in which Sarah Stonesifer introduces you to the literacies and click below to explore further. 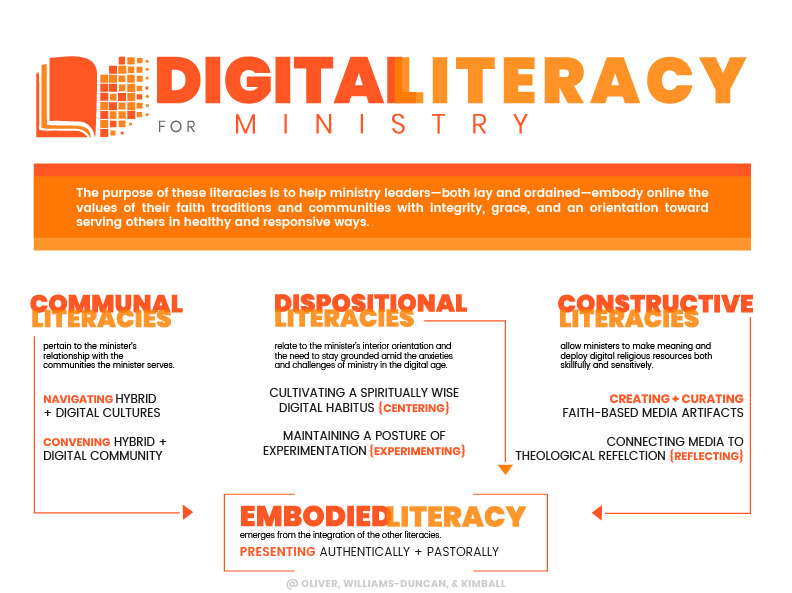 Through our research, we identified seven digital literacies for ministry. They represent our best effort to enumerate crucial competencies for ministry at a time when technology is reshaping culture and religion practice. Watch the video or click below to explore the literacies. 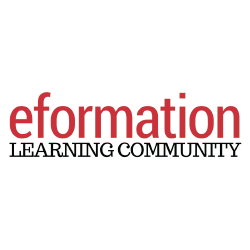 As we worked with these literacies, it became apparent that there some of the literacies were closely linked, which led us to identify four types of literacies: communal literacies (how do I build community online? ), dispositional literacies (how do I behave online? ), constructive literacies (how do I make, find, and share online?) , and embodied literacies (how do I present myself online?). In the graphic below, you can see how communal, dispositional, and constructive literacies all lead to embodied literacy. Navigating Hybrid And Digital Cultures- Ability to move with confidence through many relevant spaces and communities online, including hybrid spaces that have a strong correlation to a particular face-to-face community. Convening Hybrid And Digital Community- Ability to bring together groups online and help them flourish as communities—learning from, supporting, and otherwise engaging with each other. These are “Art of Hosting”-type skills applied online. Maintaining A Posture Of Experimentation- Orientation that will allow ministers to explore new tools, try out strategies, and otherwise innovate (and simply keep up) in a fast-changing digital landscape. Cultivating A Spiritually Wise Digital Habitus- Ability to apply the insights of spiritual traditions to the daily practice of digitally mediated social participation. Presenting Authentically And Pastorally Online- Ability to explore, claim, and present in online spaces appropriate traits of religious leadership, paying particular attention to continuities and discontinuities with one’s in-person identities. This literacy involves questions of authenticity, authority, vulnerability, and intentional ethical conduct. Connecting Media Theory And Theological Reflection- Ability to critically reflect on new media theory and practice from a theological point of view and on religious belief and practice from a media studies point of view. Creating And Curating Faith-Based Media Artifacts- Operational fluency with tools and methods for both constructing and critically collecting new media genres and objects. Obviously, these literacies are not mutually exclusive. And we know they won’t include everyone’s priorities. But they represent our best effort to enumerate crucial competencies for ministry at a time when technology is reshaping culture and religion practice—and hopefully vice versa. Continue scrolling for descriptions of the literacies, interview excerpts, real-world examples, and resource links to model assignments and classroom practices for developing each literacy. To learn more about each literacy and see the tagged resources, click on each literacy above or in the main menu.